Many of today's car audio products consist of a lot of custom tooled parts, all which cost extra money. The design goal for the SQ Series subs was to engineer phenomenal audiophile-grade subwoofers that do not cost a fortune. If you're looking for chrome or something really flashy, look somewhere else. If you're looking perfect subwoofer performance, look no further. SQ competitors do not need gobs of bass, so the 12" comes with dual 2-ohm VCs to wire a single sub to a Class A/B or Class D amplifier. 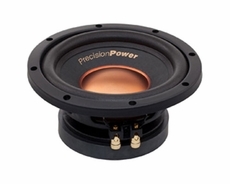 The 8" comes with dual 4-ohm VCs to wire a pair to either class of amplifier.